It's the time when Trevor Bolder (ex-David Bowie, Mick Ronson and a reformed Spiders From Mars) was recruited. "I knew Heep were the right band for me - we hit it off immediately", he said. "I'd always been into heavy rock before joining Bowie anyway". ... But we remember David Byron is no more the frontman. They needed a Vocal. And thus it was happening that David Coverdale, Ian Hunter or Gary Holton were targeted. Coverdale auditioned but the decision was not made. He had the chance to form Whitesnake and so he did. So John Lawton, established in Germany (with Lucifer's Friend); other band is Les Humphries Singers and featured in Roger Glover's 'The Butterfly Ball' at the Royal Albert Hall. The band got to hear a tape of Lawton and tracked him down in Germany, before hauling him over to England for auditions. Box says that he wasn't quite what they were looking for, "but his pipes were perfect and so we went for the music end of it". His bluesy and powerful vocal style gave Heep hope for the future. 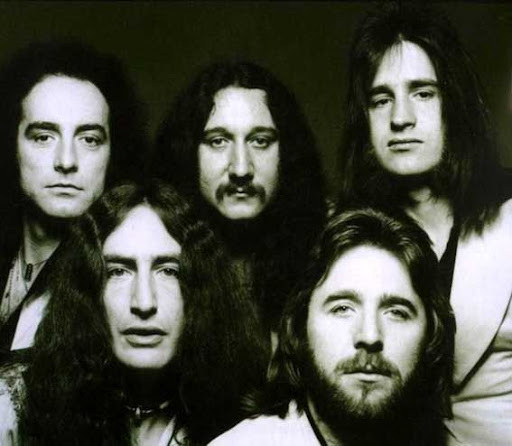 The problems appears in the Autumn of 1979 when the dead-line has shown again for Uriah Heep. Ken Hensley wanted all and Mick Box said "Everything he wrote, he had to use, and that's not right". Gery Bron was again in the situation to chose between Hensley and the frontman. Therefore John Lawton left the band.